Ozark Rope Sandals are perfect for the beach, pool, boat, or river. We offer a full range of sizes for men and women, including custom sizes to fit every foot. 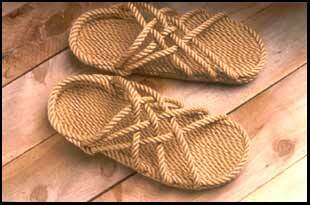 Our rope sandals come in a wide variety of colors, from solid beige to fun tri-colors. You can even order your sandals to complement your beach wear and leisure apparel. Our rope sandals are colorfast, saltwater resistant, and safe to wear in chlorinated water. Navigating this site with the menu. On Sandals Selection, you will see our product line, Ordering Facts for detailed instructions on ordering, About/Contact to learn more about our company or to contact us, and Links for other sites we think you'll enjoy.